Maple Leaf Memories: New Annual Catalogue!! Hello, I'm excited to be sharing the NEW 2016-2017 Stampin' Up Annual Catalogue with you today! 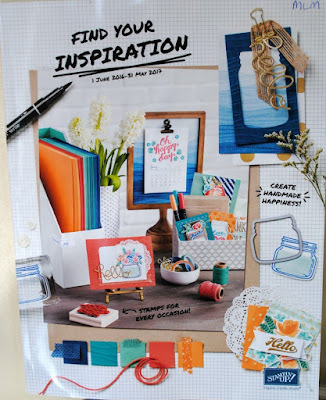 The catalogue is jam packed with lots of new stamps, punches, dies, paper and accessories, I think it is Stampin' Up's best catalogue yet, but then again, I am a bit biased!! You can see all the new products in my Online Shop, just click on the link at the end of this post. If you have shopped with me in the last 6 months you will receive a FREE copy in the post. There are also two fantastic promotion running during June. During June you can earn an extra £25/35 Euro for each event/order over £250 and with so many great products in the new catalogue, this offer is the perfect way to get even more items from your wish list for FREE!! 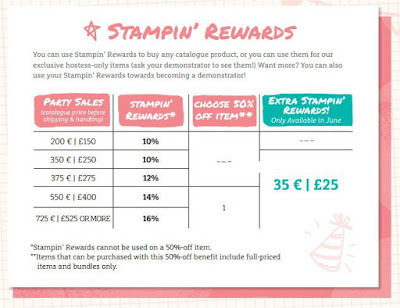 For example: If you spend £250 from the new catalogue, you will receive 10% Stampin' Rewards + £25 extra which is £50 in FREE PRODUCTS!! The more you spend, the more rewards you receive. The Starter Kit is already great value in itself but, during June, you can choose TWO stamp sets of any value for FREE as well!! For only £99 you can choose £130 of product + 2 Free stamp sets (giving you up to over £120 of FREE product)!! You can choose any product you like for your starter kit up to the value of £130 and not a penny more. Have your list ready? Click HERE for the online joining form. Once you have chosen your kit, simply sit back and wait for it to arrive and enjoy being a part of the friendly and inspirational Stampin' Up Family.